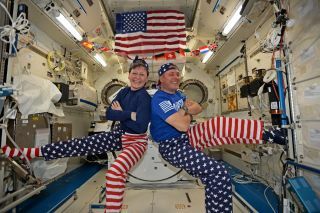 NASA astronauts Peggy Whitson and Jack Fischer celebrated 2017's Fourth of July in space on the International Space Station with a stars-and-stripes photoshoot. Today (July 4), people all across the U.S. will celebrate Independence Day with cookouts, flags and fireworks. On the International Space Station, things will be a bit more subdued — with an American flag photoshoot and plenty of science to do. NASA astronauts Peggy Whitson and Jack Fischer will be celebrating the national holiday on the orbiting outpost, although they will not take the day off due to some scheduled science operations, a NASA representative told Space.com via email. In lieu of a July Fourth vacation, the crew members took yesterday (July 3) off, the representative said — right after they released a Dragon cargo spacecraft from the station early that morning. NASA astronauts Jack Fischer and tried a variety of poses in their stars-and-stripes gear to celebrate Independence Day 2017. At the moment, there are no plans for a special meal on the station, but that could change at the discretion of the astronauts, the representative said. And unfortunately, fireworks displays taking place on Earth are too dim to be visible from the orbiting laboratory, the representative said. (However, some NASA astronauts have said they were able to spot fireworks from the station). This is Whitson's second July Fourth in space. On June 5, 2002, during her first space mission as a NASA astronaut, she flew to the station aboard the Space Shuttle Endeavor, as part of STS-111. On the station she joined the crew of Expedition 5. Whitson recently broke the record for most cumulative time spent in space by a NASA astronaut. She and Fischer are both scheduled to return to Earth in September. Editor's Note: This article was updated at 11:30 a.m. with the astronauts' photos and video from space.